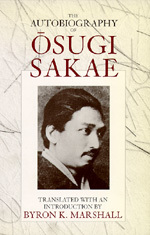 In the Japanese labor movement of the early twentieth century, no one captured the public imagination as vividly as Osugi Sakae (1885-1923): rebel, anarchist, and martyr. Flamboyant in life, dramatic in death, Osugi came to be seen as a romantic hero fighting the oppressiveness of family and society. Osugi helped to create this public persona when he published his autobiography (Jijoden) in 1921-22. Now available in English for the first time, this work offers a rare glimpse into a Japanese boy's life at the time of the Sino-Japanese (1894-95) and the Russo-Japanese (1904-5) wars. It reveals the innocent—and not-so-innocent—escapades of children in a provincial garrison town and the brutalizing effects of discipline in military preparatory schools. Subsequent chapters follow Osugi to Tokyo, where he discovers the excitement of radical thought and politics. Byron Marshall rounds out this picture of the early Osugi with a translation of his Prison Memoirs (Gokuchuki), originally published in 1919. This essay, one of the world's great pieces of prison writing, describes in precise detail the daily lives of Japanese prisoners, especially those incarcerated for political crimes. Byron K. Marshall is Professor of Japanese History at the University of Minnesota and the author of Capitalism and Nationalism in Prewar Japan: The Ideology of the Business Elite, 1868-1941 (1967).